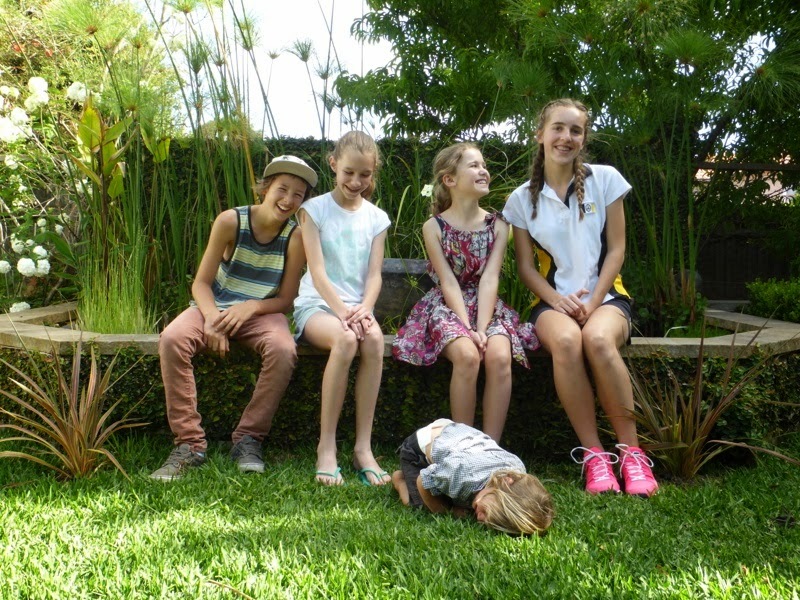 We have been staying with family while in Sydney, children and dogs running through the house leaving behind trails of shrieking delight, and of course the tears that sometimes dovetail such joy. 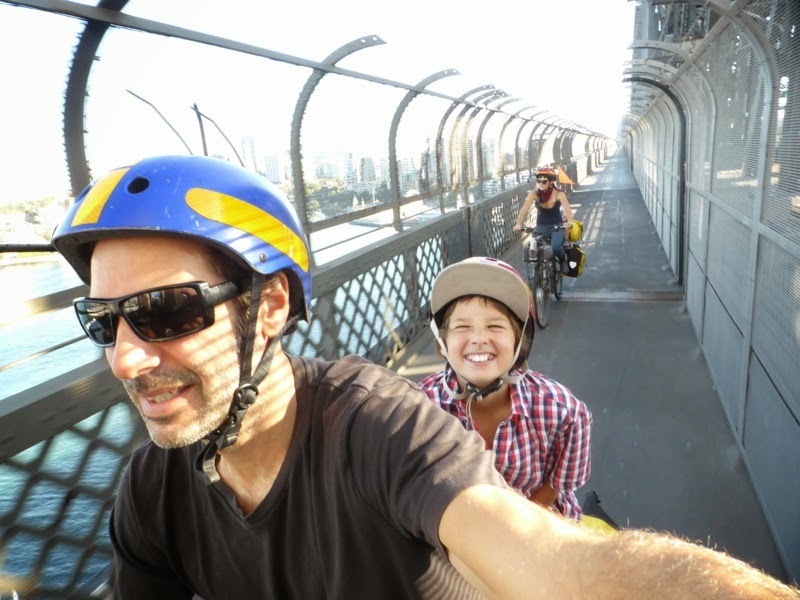 Yesterday we saddled up to ride across the harbour to the Food Forest we planted in Surry Hills in 2010. 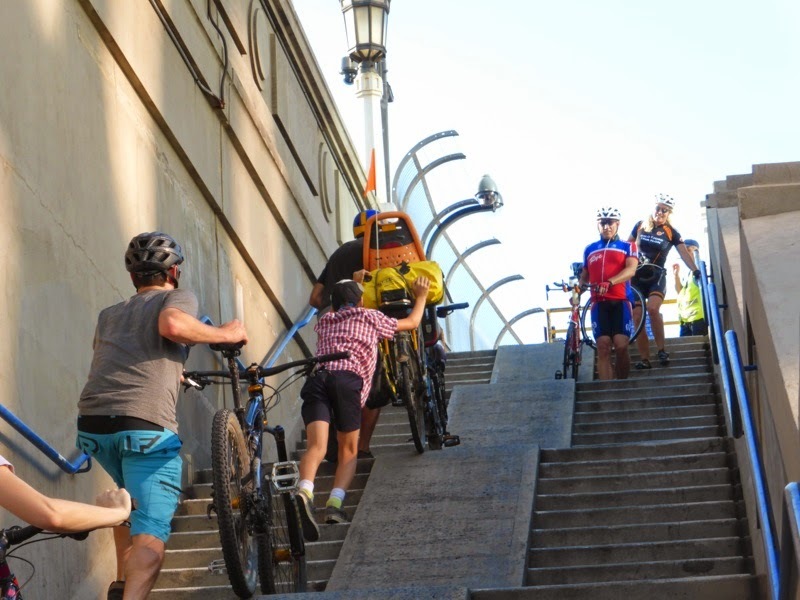 We were heading there to host a working bee and workshop, and this was to be our second Sydney harbour crossing on bikes and we knew what to expect. We were pretty excited to see the garden again, although some more than others as we rode across the city's famed bridge. 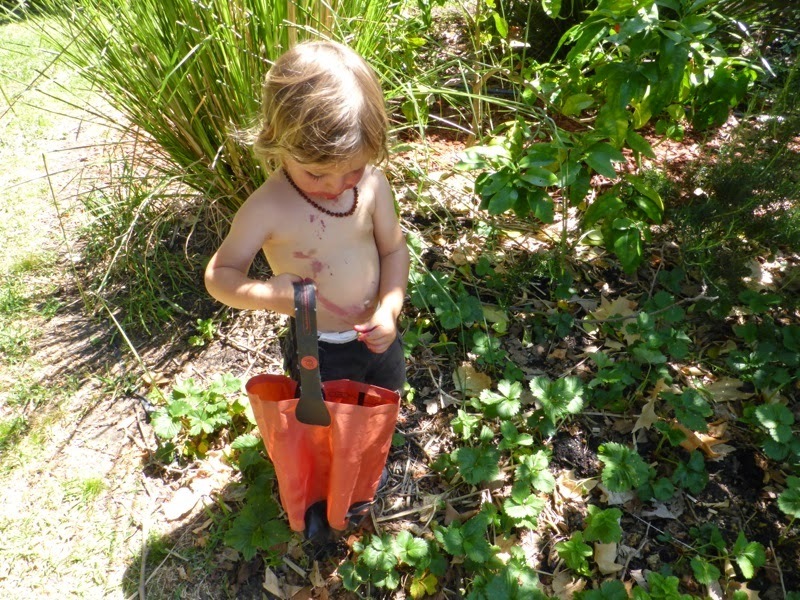 We had a plan of what we wanted to achieve at the working bee, first making sure that all cutting tools were clean, as it is very easy to pass disease between plants via secateurs. and Jeremy and Francis turned the prunings into wood chips. 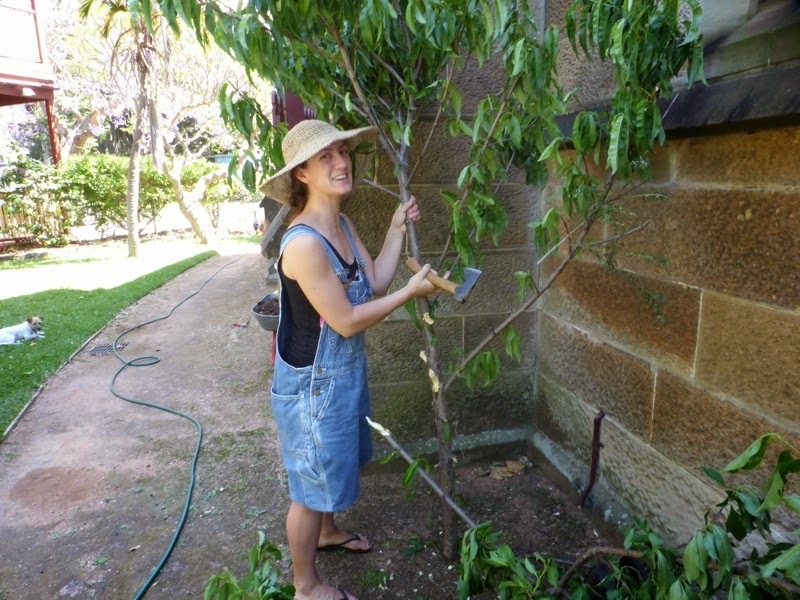 Meg was behind the camera, documenting our little group's work to mark and celebrate the garden's fourth year. 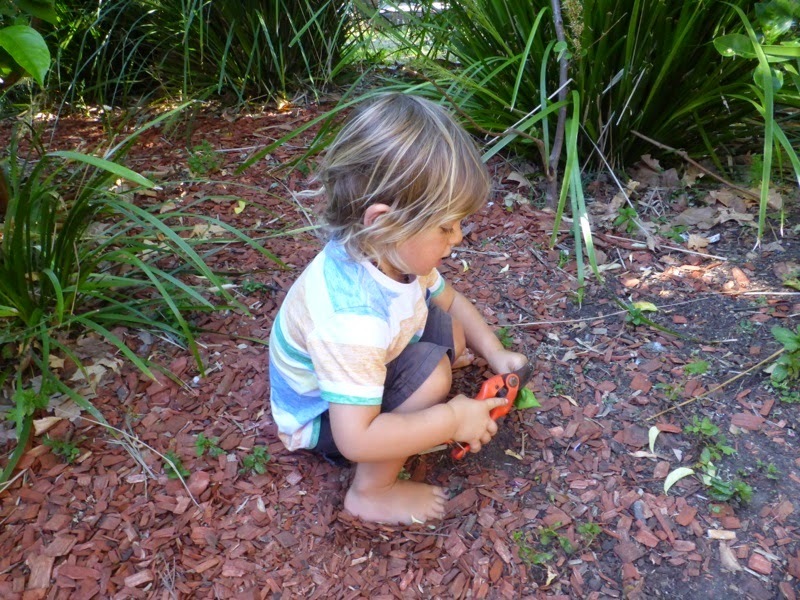 Zeph helped Amanda collect stink bugs (Musgraveia sulciventris) off the citrus. They collected a hundred or more, wearing dark glasses to protect their eyes from the toxic spray the bugs can emit. It was Jeremy's idea to put these handsome pests into hot soapy water to kill them. Amanda has been with the garden since its inception and her care and commitment has been absolutely instrumental to its success. 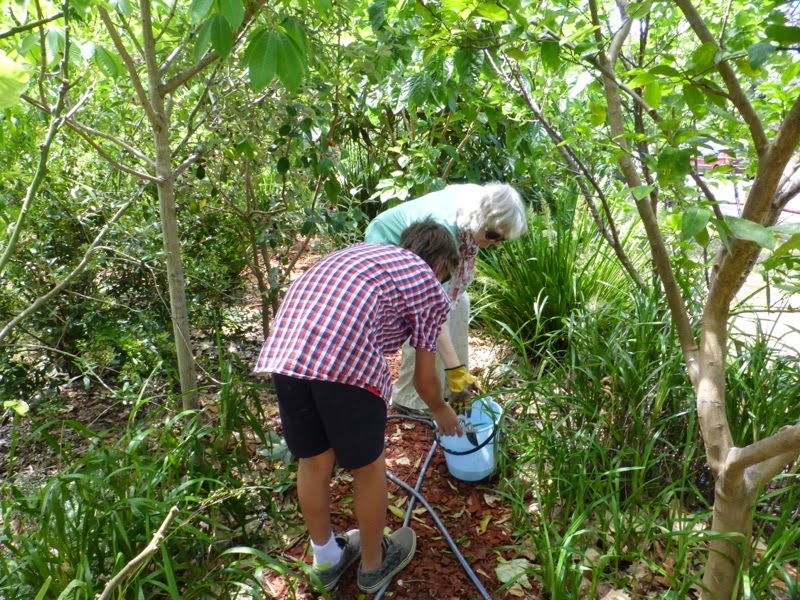 Artist as Family were keen to show local residents the bush foods, culinary herbs, edible flowers and fruit setting in the garden, as well as reinstate the north border where annual vegetables grow beautifully in sunny and semi-shaded positions. 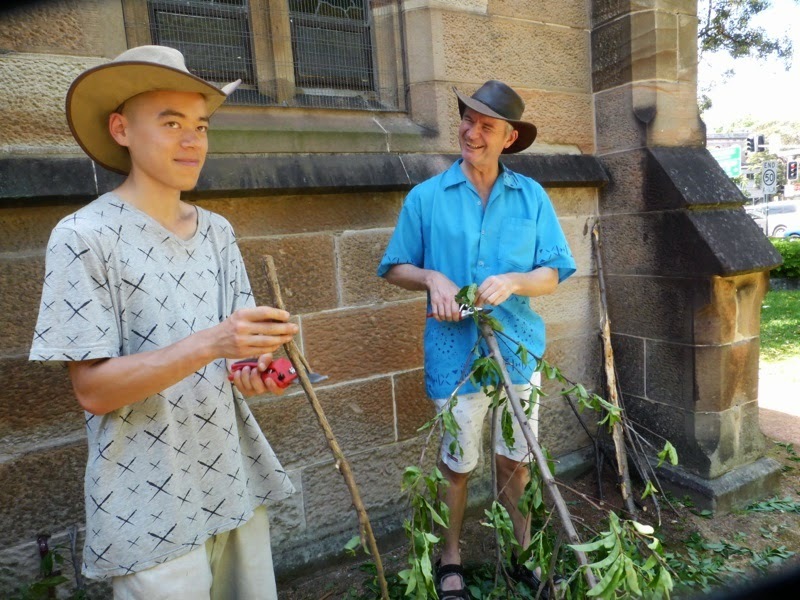 We were also keen to point out that even though this garden is on church grounds, it is a community garden and you don't have to be part of the church, or religious for that matter, to garden and enjoy the fruits of the Food Forest. In order to attract pollinators and beneficial predators to the garden we have planted many different species, mimicking a healthy forest ecology. 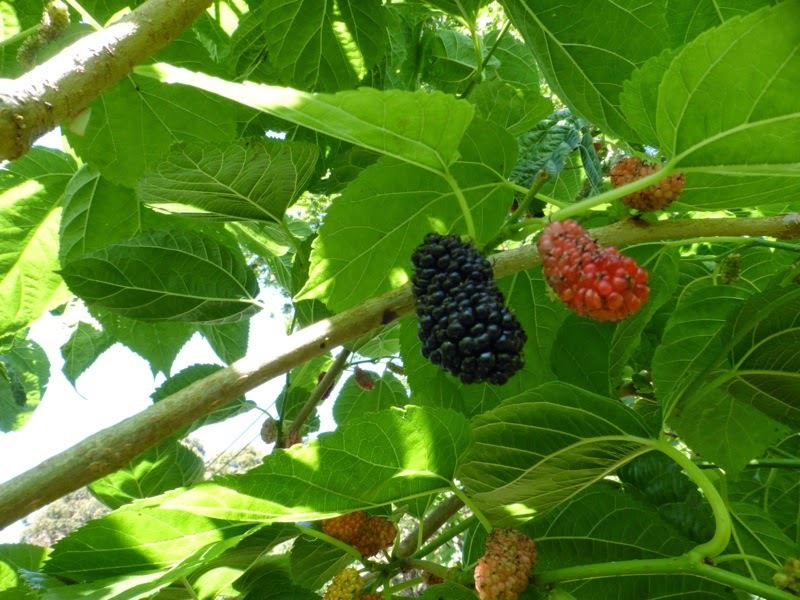 The diversity of food is also there to attract human organisms, but we recognise food knowledges have been in decline for the past two generations and many people walk past the garden not knowing what is actually going on there. A few years ago, in order to address this problem, the MCA and Artist as Family mocked up a design for a sign to be installed at the garden to help inform the public about this permanent public work. 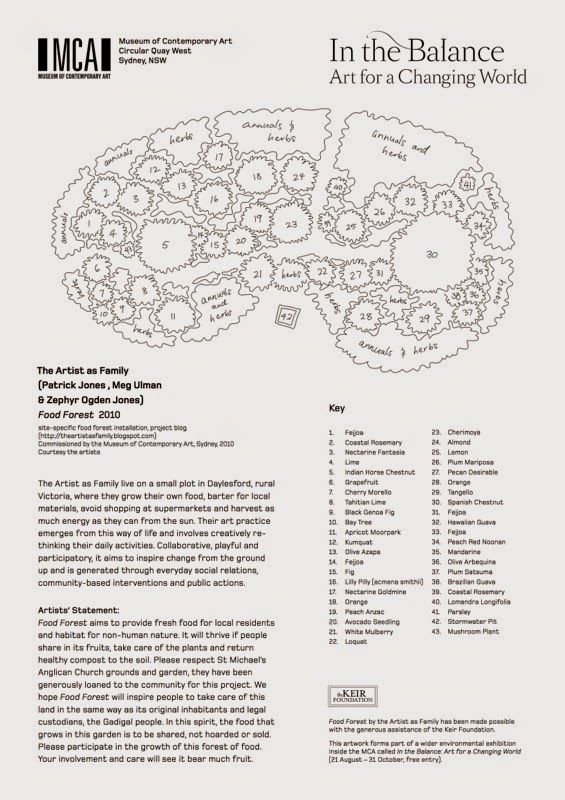 It shows a plan of the Food Forest with a key noting over 40 species of edible plants. It's probably a good thing this particular design never went ahead as a number of the species have been replaced and new plants planted. Such is the nature of an ecology. However, one thing that we feel is still missing from this 24 hr access community garden is a notice or sign to welcome participation. 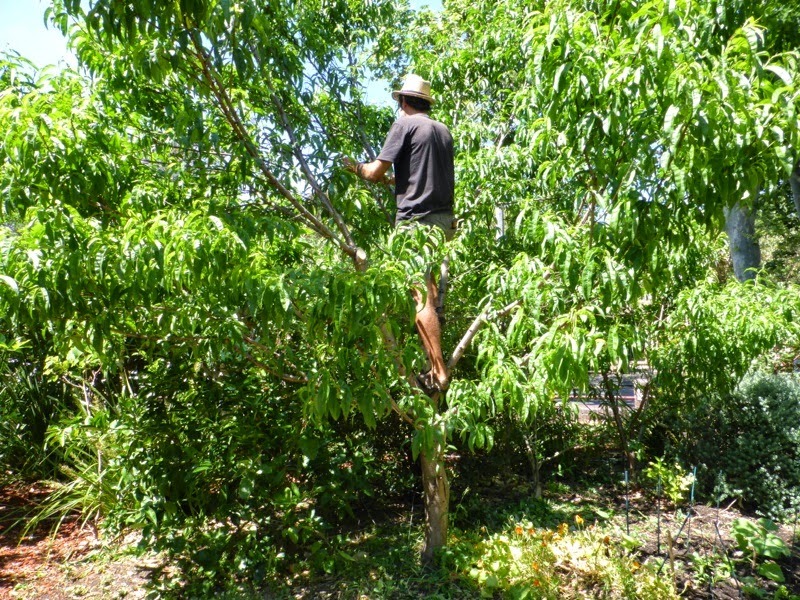 The garden also requires skilled permaculturalists and other such gardeners who know 'chop and drop' food forestry techniques. Now it requires local performers to play a part; to play in its chop and drop theatre. 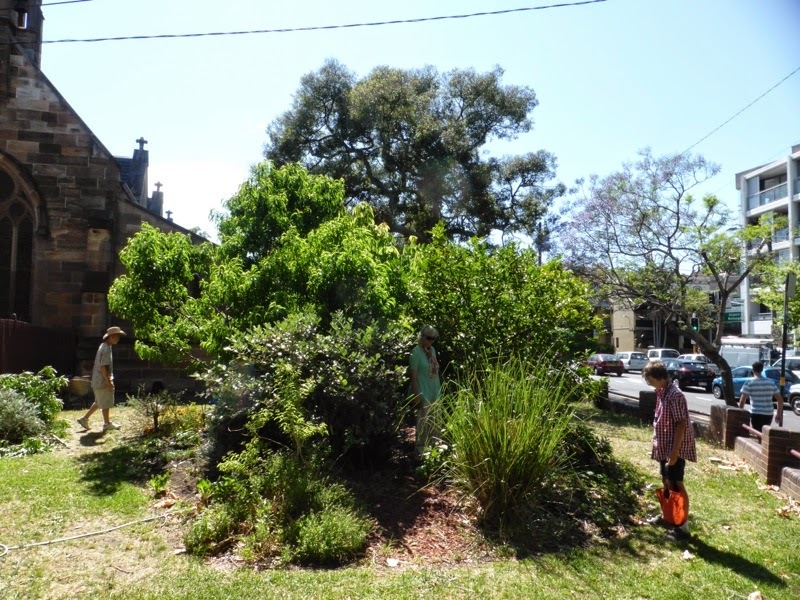 Yes, this is just a small garden, but nonetheless it is a response to generating a greener future. One of these gardens in every park, nook, 'nature strip' and common would go a long way to improving our health and the health of the world's environments. Even if these spaces only contributed 5% of our food, it would be 5% less damage we would be committing in the world. And by being involved in such processes we would be teaching our young people to be generative and not extractive, to be creators not destroyers, which would have significant reverberations for us all. 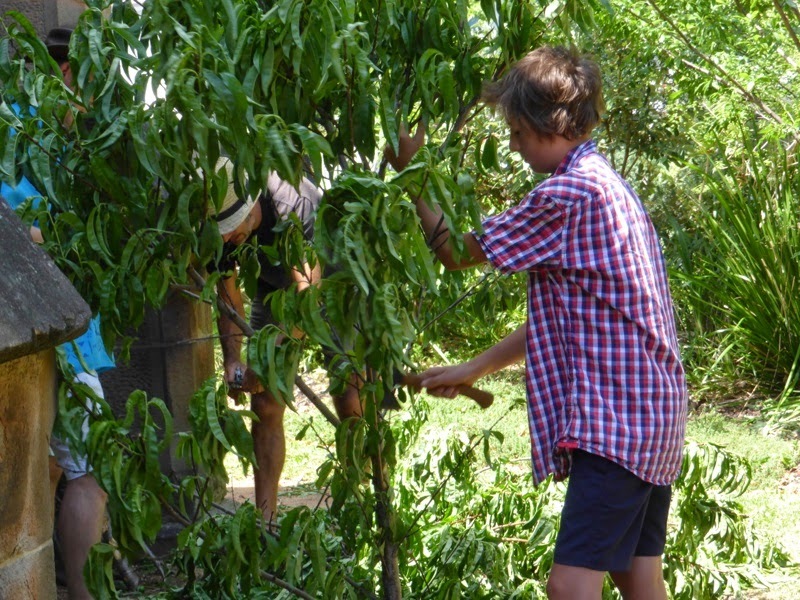 Imagine a world where everyone had or had access to a food forest like this! 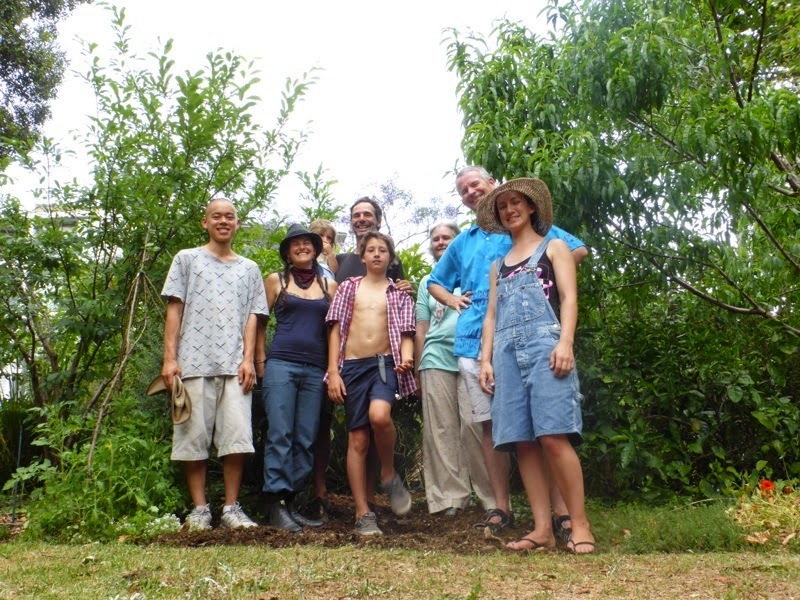 What a great thing to see and so inspiring as we begin to cobble together our own food forest here. Ah, yes RLH, a world where war was not given any status and our children were nourished with loved plant life not greed, pesticides and frankenfood. That's what we're working towards. I used to live just down the road from here, back when the garden was started. I had no idea it wasn't part of the church, and was always too scared to take anything from the garden (I walked past multiple times everyday). I thought about donating my balcony worm farm compost, but again, didn't know who to contact! How amazing though. 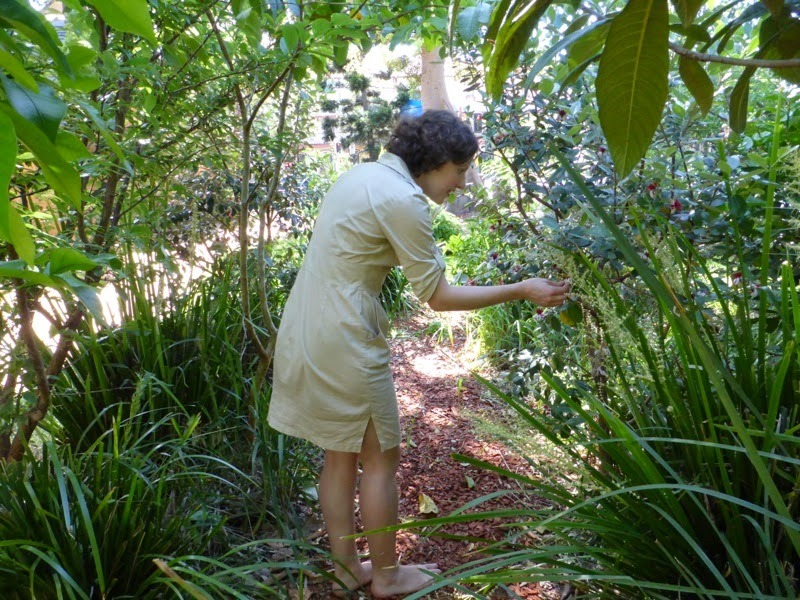 I came across your blog through Milkwood Permaculture, and have read every post with awe. Wonderful stuff. I wish I had the know how and initiative to create a food garden on public space near our current home! hello Kim, thank you for your kind words. we are currently working on getting a sign made up that will encourage people to participate at the Food Forest. 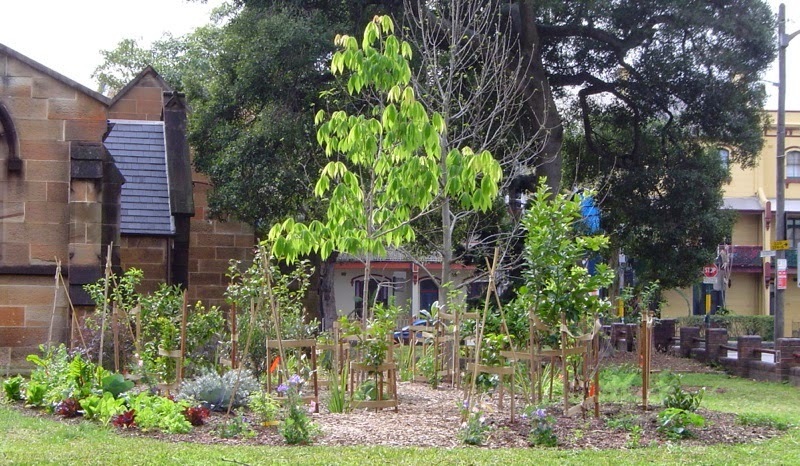 you definitely have the know-how and initiative to create a community garden in your local area. like everything worthwhile it comes about by a step by small step process, which accumulates into something wonderful over time. we all have this ability, esp those who communicate well with others, which you obviously do. you just need to gather people around you who wish to be involved. we can offer advice from afar, but there'll be others near you who will find strength in your strength and tenacity, and in working together you'll find you can do anything you want. 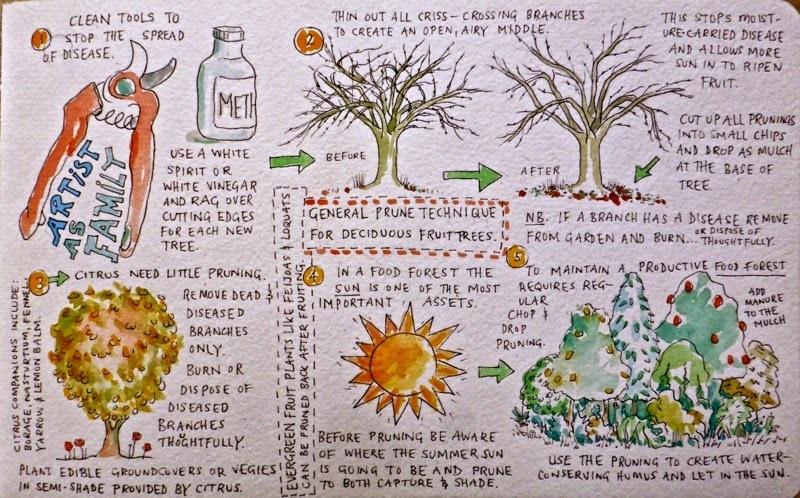 Hi AaF, I came back to this post to see if there was any info on designing a food forest. I'm looking into council approval to get one into my local little park - mostly to see if there is any financial assistance they will provide. I have no problem with guerilla gardening but I don't really have the spare cash to spend on plants that I can't propagate or grow from seed. 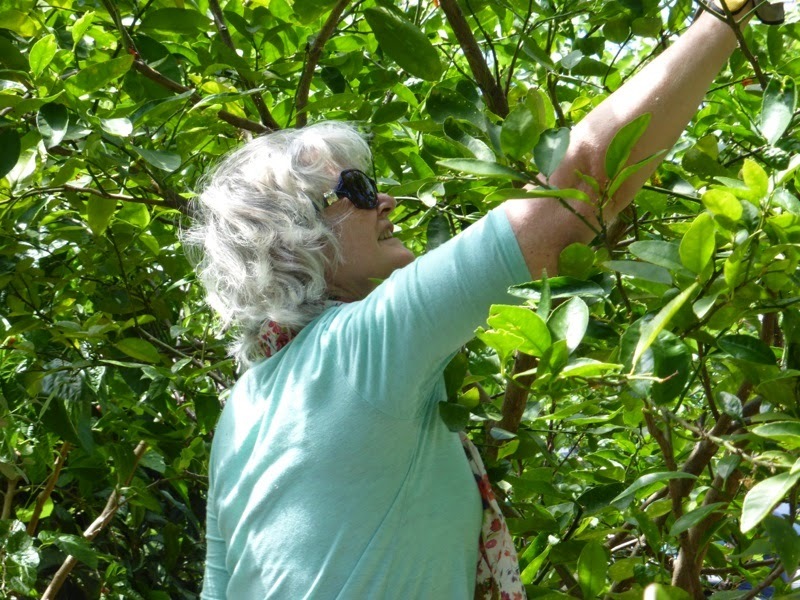 Thank you for your affirmations above, I know that you are currently on the road but I will be coming to your foraging walk in Tempe next weekend - yay! This is an awesome manual, and although it's American there are many design principles that relate and some species as well. Look forward to seeing you on Sunday.